There is nothing more satisfying than an organized closet. Believe it or not, organization reduces stress and saves time as well as money. Yes, money! When you spend too much time looking for something you know you have and can’t find it, you end up being late to where ever you were going. Frustration and anxiety will cause you to purchase a duplicate of the item you couldn’t find. Eventually you WILL find it ending up with 2 of the same. 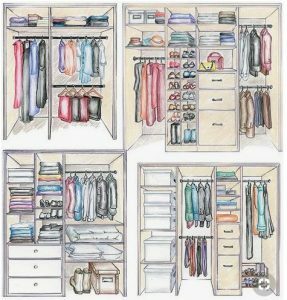 If you are lucky enough to have a walk-in closet, my recommendation would be to work with a professional closet designer. 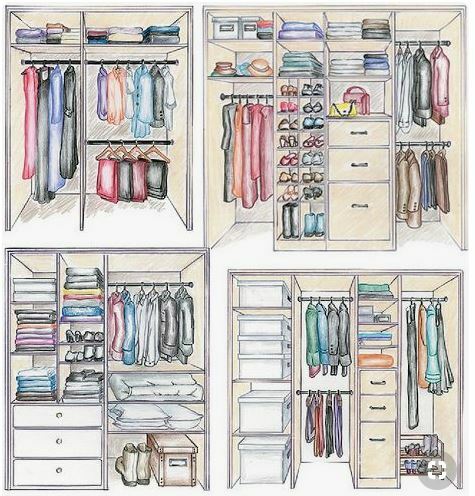 If you are a do-it-yourselfer and have plenty of time to accomplish everything for your perfect closet, then go for it. If you work with a designer, give her/him as much information to accomplish what you want your closet to look like. You can certainly assess your needs before you talk to the designer. Consider everything you want to store and how you want them stored. Your closet designer will ask you the following questions. The more information you can share with your designer, the faster the project will go and the happier you will be with the end result. Do you need more drawers or hanging storage? How long do your hanging storage areas need to be? Do you need to accommodate storage for dresses, suits or long winter coats? Do you hang your slacks full length or draped over a hanger? Do you like open shelving or do you want them covered with doors? Do you roll your belts or hang them? Need jewelry drawers with custom dividers? Your project is a collaboration between you and your designer so share pictures and information of things you like.